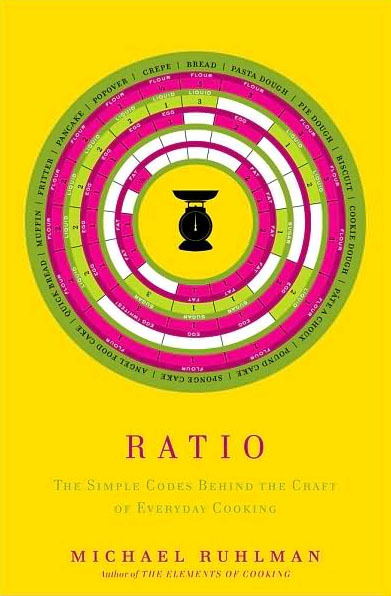 “Ratio: The Simple Codes Behind the Craft of Everyday Cooking” just appeared this month and promises that it “will unchain you from recipes”. That’s a good thing, because by knowing a couple of basic ratios you can cook anywhere without bringing your recipes. I’m quite fond of books like that and look forward to leaf through it once I get my hands on a copy. 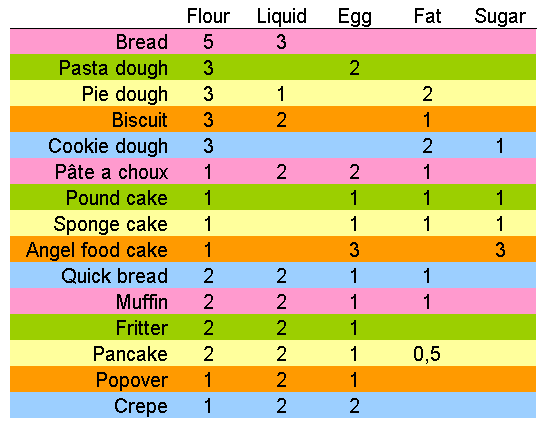 Bakers have been using ratios for ages, better known as Baker’s percentages, so the concept is not new. When baking bread, knowing that you need 6 dL for each kg flour will make a decent bread (but not necessarily an exceptional one!). 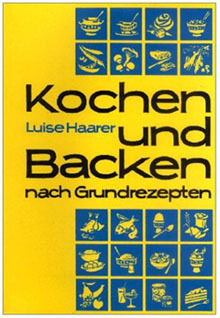 Ruhlman extends the concept and describes 33 useful ratios for the kitchen. One examples is cookies, and it’s as simple as 1-2-3: 1 part sugar, 2 parts fat and 3 parts flour. Add flavor according to taste and baking powder and/or eggs for a lighter texture. Now that’s what I call a short recipe! The only thing that puzzles me is why the book has 272 pages… That’s a good 8 pages to explain each ratio 🙂 But for an experienced cook the only thing you actually need is the ratio. And if you take a close look at the cover it actually displays several of the ratios. I’ve copied them into the table below so they are easier to read. You can find the remaining ratios (covering Stocks & Sauces, Farí§ir, Fat-based sauces, Custards) in the Barnes & Noble preview of the book. And if you combine these ratios with some of the flavor pairings from “The flavor bible” you should be ready for a lot of fun in the kitchen! Sounds like a very cool book, adding it my Amazon wishlist right now. I couldn’t find the ratios you mentions in the BN preview though. See pages ix and x.
only £13 from Amazon ? I’m sold. These are the kind of books I love to have handy. Thanks for sharing. Wait, so is that 1 part eggs, or 1 egg? Like if I make pasta is that 3 cups flour and 2 eggs or 3 cups flour and 2 cups of eggs? Its all by weight so cups/eggs don’t come into the equation. E.g. for 500g pasta dough just mix 200g eggs with 300g flour (and salt/olive oil if you are so inclined). An egg is roughly 57g (depending on size), our medium eggs here are a very convenient 50g (considerate free range chickens who are good at math) . This will be pretty useful to me, since I don’t cook with eggs. The substitutes like lecithin, corn starch, etc., are easier to do by mass then through egg-equivalents. Great idea. Shame the B&N preview doesn’t work at all! I just saw Michael Ruhlman speak last night and got my copy of Ratio signed. What struck me about your post is that you talked about a German cookbook, and Ruhlman told a story about getting the initial list of ratios he worked with from an old German instructor at the CIA. He is such a charming fellow – very enthusiastic about food and cooking and how it brings us together. Haha – The ratios need to include 1 column for “common sense”. Pasta dough needs WATER!!! !eggs and flour aren’t enough – try it! And I bet its the ratios refer to 1 measure of each NOT ratio by weight – so I bet its NOT 2 portions by weight of eggs for every 3 portions by wieght of flour but INSTEAD its 3 cups of flour with 2 whole eggs PLUS water – AGAIN you have to start with common sense in the kitchen which comes from experience which comes from using basic recipes which only then makes the Ratios a meaningful book for a half-way decent cook – NOT for a rookie – so don’t waste your money on Amazon yet! You definitley can make pasta with just eggs and flour if it doesnt work for you you are probably not an very experienced cook. Keep praticing! That’s a huge promise. Can’t wait. I own The Flavor Bible and love it.